IMAGE: This is an example of a metasurface, which can create negative refraction. The results of computer simulations carried out by the authors showed that it would be a high performance material for light with a wavelength from 400-500nm (violet, blue and light blue). Efficiency in this case is defined as the percentage of light scattered in a desired direction. The efficiency of the material is approximately 70% for refraction, and 80% for reflection of the light. Theoretically, the efficiency could reach 100%, but in real metals there are losses due to ohm resistance. A metamaterial is a material, the properties of which are created by an artificial periodic structure. The prefix 'meta' (from the Greek μετ? — beyond) indicates that the characteristics of the material are beyond what we see in nature. Most often, when we talk about metamaterials, we mean materials with a negative refractive index. When light is incident on the surface of such a material, the refracted light is on the same side of the normal to the surface as the incident light. The difference between the behaviour of the light in a medium with a positive and a negative refractive index can be seen, for example, when a rod is immersed in liquid. The existence of substances with a negative refractive index was predicted as early as the middle of the 20th century. In 1976 Soviet physicist V.G. Veselago published an article that theoretically describes their properties, including an unusual refraction of light. The term 'metamaterials' for such substances was suggested by Roger Walser in 1999. The first samples of metamaterials were made from arrays of thin wires and only worked with microwave radiation. Importantly, the unusual optical effects do not necessarily imply the use of the volumetric (3d) metamaterials. 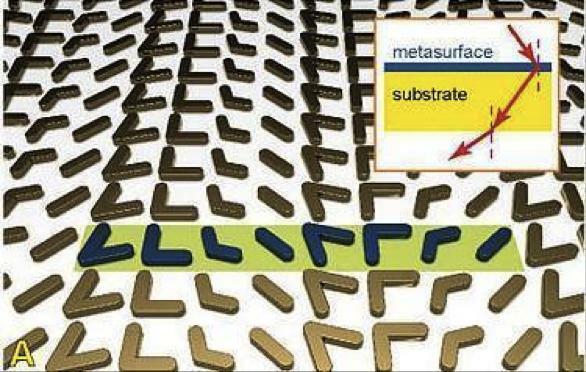 You can also manipulate the light with the help of two-dimensional structures — so-called metasurfaces. In fact, it is a thin film composed of individual elements. The principle of operation of the metasurface is based on the phenomenon of diffraction. Any flat periodic array can be viewed as a diffraction lattice, which splits the incident light into a few rays. The number and direction of the rays depends on geometrical parameters: the angle of incidence, wavelength and the period of the lattice. The structure of the unit cell, in turn, determines how the energy of the incident light is distributed between the rays. For a negative refractive index it is necessary that all but one of the diffraction rays are suppressed, then all of the incident light will be directed in the required direction. This idea underlies the recent work by the group of scientists from the Moscow Institute of Physics and Technology and the Landau Institute for Theoretical Physics. The unit cell of the proposed lattice is composed of a pair of closely spaced silver cylinders with a radius of the order of 100 nanometres (see figure). Such a structure is simple and operates at optical wavelengths, while most analogues have more complex geometries and only work with microwaves. The effective interaction of pairs of metal cylinders with light is due to the plasmon resonance effect. Light is absorbed by the metal rods, forcing the electrons in the metal to oscillate and re-radiate. Researchers were able to adjust the parameters of the cell so that the resulting optical lattice response is consistent with abnormal (i.e. negative) refraction of the incident wave (see figure). Interestingly, by reversing the orientation of the cylinder pairs you can get an abnormal reflection effect. It should be noted that the scheme works with a wide range of angles of incidence. The results achieved can be applied to control optical signals in ultra-compact devices. In this case we are talking primarily about optical transmission and information processing technologies, which will help expedite computer processing in the future. The conventional electrical interconnects used in modern chips are operating at the limit of their carrying capacities and inhibit further growth in computing performance. To replace the electrical interconnects by optical we need to be able to effectively control optical signals at nanoscale. In order to solve this problem the efforts of the scientific community are focused to a large extent on creating structures capable of 'turning' the light in the desired direction. It should be noted that an experimental demonstration of anomalous scattering using the lattice described above requires the manufacture of smooth metal cylinders separated by a very small distance (less than 10 nanometres). This is quite a difficult practical problem, the solution of which could be a breakthrough for modern photonics.